A Gurn from Nurn: Paddling pool seems to still rock with Nairn folk - have Highland Council got it wrong on what the public want for the Links? 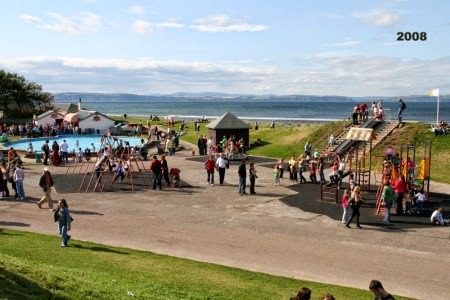 Paddling pool seems to still rock with Nairn folk - have Highland Council got it wrong on what the public want for the Links? Earlier today we published a Highland Council press release on their findings so far from their consultations on the Links Future. You can read that press release in its entirety here. In the Press Release Tom Heggie states: “Both events were well attended, attracting views and comments from around 100 members of the public"
Then in relation to the findings of the consultation he continues: "From the two events a number of key points have emerged. It is clear that people recognise a need to develop and improve the Links area, but they want the environment to be respected and well managed. The open spaces, the trees and the views are highly valued. People would also like to see some improvement to the play equipment, with a a new water feature in place of the paddling pool. " The press release information has been shared far and wide in the Nairn social media world this evening and it has drawn quite a bit of criticism from supporters of the Team Hamish initiative who feel that the Highland Council are not treating the popular charity fairly. And then (about half an hour ago a poll emerged on the Nairn Rocks site - a group that is facebook central for Nairn with over 9,700 members). The poll asked the question "Today the Highland Council announced that the people of Nairn have indicated to them that they would like a new water feature to replace the paddling pool. So here's a straw poll:"
The figures to the right of the options are the numbers of votes after about half an hour. This observer is not sure how you work that out as a % when you have a third option question for both - could you say that at the time of writing there is a 75% majority in favour of keeping the pool? Whatever the figures - more people have had a say on the Links in 30 minutes of this poll than did so across the entire two events run by Highland Council. Are Highland Council getting it badly wrong on development on the Links? UPDATE - Almost 24hours later and 500 votes in on the poll still with about the same majority in favour of keeping the padding pool. So, around 100 members of the public and Mr Heggie decide about the paddling pool. Democracy, eh? And get ready for the Highland Council to ignore what the majority wants. Strikes me as weird that the poll is being answered by adults and not by the children who will be actually be using it. Sadly adults blinded by nostalgia don't seem to like change. The New play park equipment is amazing yet there still seem to be voices that are moaning out losing the equipment they played with in their youth. Let today's children have the play area they want and need.